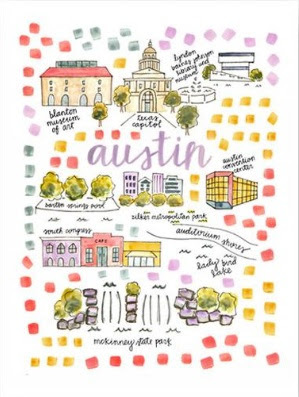 Alexandra Bee Blog: Austin Recommendations, Please! Friday night, we had two fun couples over for dinner, and stayed up until the wee hours of the morning with them talking and laughing. Saturday was low key. We went to see a movie with my dad and got an early dinner; and yesterday, we headed over to some of our best friends' parents' house for an oyster roast! I wish I could rewind a few days and do it all over again! Today, I'm reaching out asking for your help. Whenever I travel, I find myself heading to the blog to ask you all for tips. In fact, many of our trips, have almost been entirely planned via blog comments! We're headed to Austin shortly to celebrate the wedding of one of Bryce's best friends from VMI. To give you an idea of the "free" time we have to fill: We'll have about half a day once our flight arrives to get settled and maybe grab a bite to eat before getting ready for the rehearsal. The next day, I'll have about half a day to myself while Bryce attends to groomsman's duties. I definitely plan to stop by the Katie Kime flagship store. What other spots should I visit downtown? Good shops? Somewhere I could grab a solo lunch? Then, post-wedding, we'll have about a day and a half to explore and do all things Austin: Where should we go for brunch these days? What about for a fancy date-night dinner? Any "attractions" we should fit in? We're staying right in downtown. Here are some blog posts of when I've gone to Austin! It's such a fun city, you're going to love it! I was in Austin on a work trip and had a fair amount of time to explore. I had lunch on a Saturday outside at Guero's Taco Bar solo and it was so fun, they had live music and the food was good. I loved the South Congress area - super cute shops/antique stores (including Kendra Scott) and lots of restaurants. I wish I had had more time there. Jo's Coffee is great for a quick breakfast (aka breakfast tacos), there's one right downtown. Have fun, it's a great city! You need to email Kate! Check out her blog here- http://elefantitasalegres.blogspot.com she is from Austin and lives there now! I can't wait to hear all about your trip! Austin always will hold a place in my heart, love it there!